• When power is removed, the actuator remains in position. 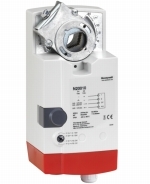 • For modulating control models: Control input signal can be voltage or current. • For modulating control models: Autoadapt dipswitch. With this function the full span of the control input signal will be used for the applicable angle or rotation.